Gemma Doyle isn’t like other girls. Girls with impeccable manners, who speak when spoken to, who remember their stations, and who will lie back and think of England when it’s required of them. No, sixteen-year-old Gemma is an island unto herself, sent to the Spence Academy in London after tragedy strikes her family in India. Lonely, guilt-ridden, and prone to visions of the future that have an uncomfortable habit of coming true, Gemma finds a chilly reception. But she’s not completely alone... she’s been followed by a mysterious young man, who warns her to close her mind against the visions. For it’s at Spence that Gemma’s power to attract the supernatural unfolds; there she becomes entangled with the school’s most powerful girls and discovers her mother’s connection to a shadowy group called the Order. It’s there that her destiny waits... if only she can believe in it. A Great and Terrible Beauty is a curl-up-under-the-covers kind of book... a vast canvas of rustling skirts and dancing shadows and things that go bump in the night. It’s a vividly drawn portrait of the Victorian age, when girls were groomed for lives as rich men’s wives... and the story of a girl who saw another way. 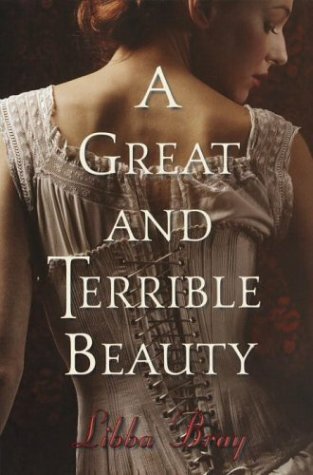 A Great and Terrible Beauty is the quintessential tale of a girl bound to a destiny as tight as her corset; a road that leads past finishing school to a quiet and uneventful life as a wife and mistress of a household. In a time when girls are groomed for marriage and not much else, it must be difficult tread against the grain. Even worse: to not fit in at all, even when you long to do so. So imagine the temptation of magic strong enough to change it all. The girls who feature in A Great and Terrible Beauty each have their own cross to bear, reasons why they loathe the path ahead of them; be it being too plain, hiding an un-marriageable flaw, wanting more to life, or fearing the unknown magic within her. Funny enough, deviating from society’s plan is exactly the kind of dream that would be put down as girlish fancy by the adults around them. Hence the focus: the dream of more is all they have; their lives are plodding along on a direct course for boredom. Every dance lesson reminds them they will be on display for eligible men to cluck over, as they choose wives much the same as they might choose a new pocket watch. What surprised me in this book? The cutting. There’s an underlying gravity to the longing of these girls, a quiet desperation, and it was refreshing to see the unlikely topic of cutting appear — even peripherally — in the narrative. Because it’s what would happen in real life, and for that, I appreciate Bray’s candor with her audience. It pays in spades, of course, because the severity of cutting underlines the desperation the girls share, creates tension, and emphasizes the allure of magic and the ability to change their lot. What didn’t surprise me, and kind of disappointed me? A particular cultural group being cast as the “other” and source of magical wisdom. Of course, it is a historically accurate opinion, but it is a little too handy that mystical help happens to be in the woods just outside Spence Academy.